Name of Organization: Green Agrevolution Pvt. Ltd. Core technology used: Android based front end for last mile service providers and Farmers, cloud telephony for call centre and IVR & Odoo based customized backend for various users. 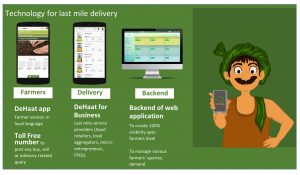 DeHaat is an ICT based platform which connects small farmers to their various needs – seeds, fertilizers, equipment, crop advisory & market linkage through network of trained micro entrepreneurs. Currently 80+ DeHaat micro entrepreneurs are serving more than 42,200 farmers in Bihar, U.P. & Odisha for their various agri demands related to Input, Information & Market linkage. DeHaat platform has already listed 350+ different agricultural inputs from companies like UPL, IIL, IFFCO, DuPont, Tata, Bayer & Yara. More than 65 institutional buyers are also associated for their agricultural raw material procurement directly from farmers. DeHaat also has feature to capture farm level queries of farmers & to send to technical person on real time basis. It also contents an exhaustive crop-pest database which has been developed in house for all prevailing crops. Currently DeHaat is focusing on 3 major agri services – Agri Input, Crop advisory & Market linkage of farm produce. Farmers can place the order related to any of their agri need through DeHaat help line ( 1800 270 1420), through mobile application – DeHaat or simply they can go to their closes DeHaat physical centers. The demand from farmers is transferred to respective DeHaat micro entrepreneurs and fulfilled on same day. Each DeHaat micro-entrepreneur caters to 600-800 farmers in a radius of 3-5 km. These micro-entrepreneurs also use our “DeHaat for Business” application to enroll farmers, to aggregate various demand, to visit farm, to capture crop based query & to aggregate the farm produce. On the other end, DeHaat creates direct access to farmers for various agri stakeholders – input companies, output buyers and others. As a farmers’ network, DeHaat platform is competent to serve the customized requirement of any bulk buyers to grow specific varieties or to grade right at farm gate. Similarly to place and demonstrate specific input product at right farming area with 100% visibility for any input companies. Also our internal data creates enough visibility on the yield projections, estimated harvesting time and quality for other stakeholders. 45,000+ farmes in Bihar, UP & Odisha are active through DeHaat for their day to day agri queries. In last 3 months, the platform handled 10,000+ MT volume of agri output like corn, wheat, Chilli, Litchi & vegetables while connecting farmers to institutional buyers. At the same time, DeHaat has delivered more than 20,000 orders related to agri input and 86,000 advisory related farmers touchpoints in past 3 months. DeHaat aims to become one stop destination for farmers right from which crop to grow, how to grow and where to sell. Farmers get benefitted in 3 ways -a) Reduction in cost of cultivation while buying inputs b) improvement in farm productivity due to timely and customized advisory c) better farm gate price. Consequently farmers experience more than 50% increment in their net income from agriculture. We are also planning to add other relevant services for farmers such as credit, insurance and farm equipment later this year. Our farmers acquisition cost is INR 40 & cost to serve each farmer is INR 120 per year only. However transaction by each farmers after 2-3 seasons of association with DeHaat reached to approximately INR 6500 per year. DeHaat as a technology is highly cost effective and sustainable model. Entire approach is highly data driven which makes it robust and scalable. Partner with relevant proposition for farmers and look for direct access to farmers’ network. We are looking to partner with technology or model offering credit or crop insurance to farmers which can be integrated with DeHaat platform. Also channel partners in MP, Rajasthan, Maharashtra & UP to expand DeHaat network.